Who doesn’t love a good groundbreaker prop at a Halloween party? One of last year’s breakout props, the Smoldering Zombie Groundbreaker is back for 2017 according to Spirit Halloween. 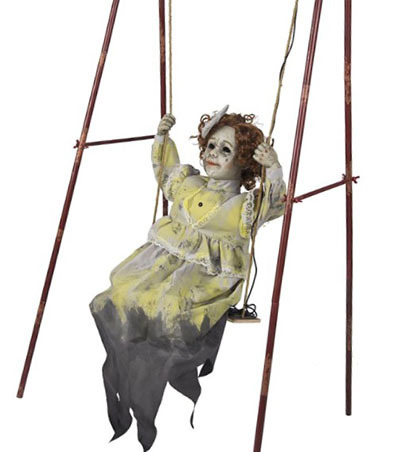 The prop retails for $139.99 on SpiritHalloween.com and is available for pre-order. The Smoldering Zombie is expected to ship in August so he will arrive in time for Halloween. 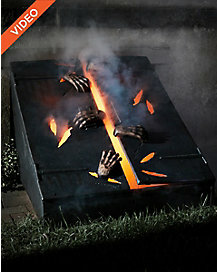 The prop looks like a zombie that as been set on fire who is trying to rise from the grave to terrorize you. He is having a little difficulty climbing out of the ground to get to you though. The Smoldering Zombie does require a fog machine to look as cool as he does in the video. It’s not included, of course. However, you can find them online for $50 bucks or so. I think the prop is very well done but I think $139 is pretty expensive and I’d rather save the money and spend it on something a little bigger that will draw more attention. I already have several groundbreakers so unless I can get him for half price on Nov. 1 I will likely pass on the prop this year. Ultimately it’s your call though. If you really like him and want to add him to your graveyard this Halloween you should grab him. It’s important to compare prices. If you don’t want to wait until the day after Halloween to get him cheaper you can often find animatronics reduced 30-40% at big box Halloween Express and Spirit stores the week of Halloween when the owners are getting nervous about excess inventory. The Smoldering Zombie comes with a sensor that is good for up to 6.5 feet away and he also has a ‘Step Here’ pad that is pretty much standard in the industry.